Today’s News, Tomorrow’s History is an ongoing series with Listenwise. This series connects Facing History’s themes with today’s current events using public radio to guide and facilitate discussions around the social issues of our time. We will take a look at the violence in Burma, or Myanmar, that has made the Rohingya leave their country. The Rohingya are a Muslim minority in a majority Buddhist country. Buddhist nationalists have protested the Rohingya’s right to vote and there are no Muslim representatives in parliament. The Myanmar government has refused to acknowledge Rohingya as a distinct ethnic group and they have been persecuted, alienated, and subjected to institutional discrimination. The Burmese government’s stance is that their actions are in response to the attacks by an armed group of Rohingya against the Burmese police. Aung San Suu Kyi, Myanmar’s leader, has denied that the government is conducting ethnic cleansing and has said they are defending the rights of the Rohingya. Listen to hear about this crisis and what the Burmese government and United States government are doing to help the Rohingya. 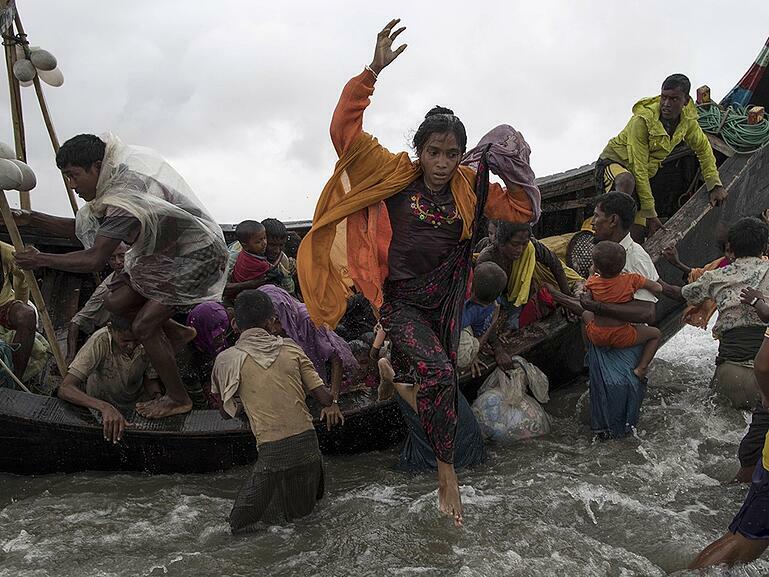 Who are the Rohingya and why are they being persecuted? How can a culture of prejudice encourage violence? How has America responded to this crisis? In your opinion, why do you think some people are persecuted? What groups face discrimination or persecution in the United States? Explore our lesson, “Responding to the Rohingya Crisis,” to help students put this crisis in historical context, while contemplating the international community’s obligation to respond. Use our lesson, “Understanding the Conditions that Lead to Ethnic Cleansing,” to introduce students to key concepts such as a nation and self-determination and explain the relationship of these ideas to the conditions that make ethnic cleansing possible. Use our reading, “Cultural Genocide,” to consider how the efforts of the Canadian government to assimilate the Indigenous Peoples through residential schools and other related policies are viewed as an intention to destroy the Indigenous Peoples of Canada as a culturally distinct group. There is a growing anti-Jewish sentiment and antisemitic Attacks have increased in the United states. Listen to hear more about what the Jewish community is facing and the response they are hoping to see from law enforcement. Muslim Americans have faced discrimination in the United States. Listen to the story, "Xenophobia and the Power of Fear" to hear how the power of fear and anger can lead to hate and discrimination. The Indiana state legislature passed a Religious Freedom Law that would make religious beliefs a valid legal defense against government regulations and in effect allow discrimination based on sexual orientation. Listen to hear how the national response forced the legislature to pass another bill. In 2015, worldwide religious freedom deteriorated and the US Commission on International Religious Freedom reported that violations included denying health care and voting rights and imprisoning people of certain religions. Listen to hear more about the state of religious freedom.